Like most women of any sense and taste, I'm in love with Neil Gaiman. I mean, what's not to love about a skinny man with unkempt hair who wears only black, and who makes up the most amazing stories and characters for a living? Throw in the deep voice and the British accent and the tech-savviness, and he's absolutely irresistible. Now only if he weren't my dad's age and married to a rock goddess. Now that I've made clear how entirely objective I am about Neil Gaiman, let me tell you about his The Graveyard Book. Actually, I don't know why I'm bothering, because it's already acknowledged as one of the best children's books to come out in recent years. It was even part of the New York Public Library's list of the best 100 children's books published in the last 100 years. The Graveyard Book is about Nobody Owens, usually called Bod, whose parents and sister are killed by a mysterious man named Jack. While the murders are being committed, the toddler somehow wanders into a graveyard, where the ghosts decide to take care of him. He is given the Freedom of the Graveyard, which means that he can see the ghosts and enter the mausoleums despite the fact that he's alive. He has a vampire and a werewolf as guardians, and they take care of his "living" needs - food, clothes, etc. Bod has an awesome childhood. He explores the graveyard, he is taught by ghosts who were teachers when they were alive, he makes friends with a little girl who visits the graveyard with her parents. 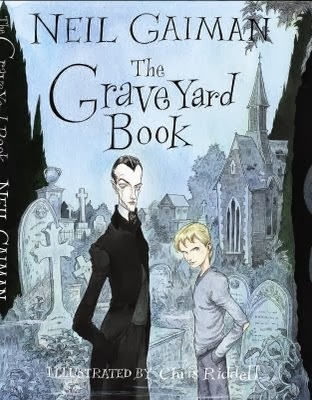 This being a Gaiman book, Bod goes through scary things as well - he explores a hidden cave underneath the oldest crypt in the graveyard, he is kidnapped by ghouls, he is almost killed on his first visit outside the graveyard. As Bod grows up, there are worrying signs that the mysterious man Jack is still pursuing him, to finish the job that he started many years ago. His guardians try to protect him, but it's clear that he will have to deal with Jack one way or the other, if he is to live a normal life and go out into the world. According to Gaiman, he thought up the concept for the book many years ago while out on a walk with his son. They wandered into a graveyard, and his son had much fun exploring. What if, Gaiman thought, a boy were to grow up in a cemetery? It took about twenty more years for the book to actually get done, but boy, was it worth the wait! Because TGB is a wonderful book. To use all the cliches in the world, it's heart-warming and funny and exciting and - did I say wonderful already? I wish Gaiman had written it back when he first thought about it, so that I could have read it through a child's eyes and loved it with a child's heart. If you know a kid who likes reading, gift her this book because she'll love it. If you know a kid who doesn't like reading, gift him this book so that he falls in love with reading.